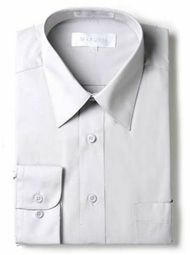 When your dress shirts require to be more fitted in nature, that is the time to start buying slim fit dress shirts. These tighter fitting dress shirts feature a much more tailored fit making the modern look all that more enjoyable. This solid silver color long sleeve slim fit shirt is made by Marquis, a leader in high quality affordable dress shirts. Fabric is made of easy to care for Cotton/Poly blend. 60%/40%.